They`ve changed the bus routes! As of April 1st 2011, the Tsuku Bus- the city`s subsidized transport service, no longer stops in front of my house- though it still does pass by as it follows its route ( as if to mock me)! Now if I want to get around town by bus I have to walk over to the old Sakura City Office. The fastest way for me to get there is to take a short-cut through one of Tsukuba`s most beautiful undeveloped areas- the wilds between the Sakura Junior High School and the former city office, which is a rich ( though unmarked) archaeoligical site ( a government office stood there more than 1,000 years ago) that is now something of a small, very unofficial, nature preserve- replete with all sorts of small animals and birds, and of course plenty of interesting vegetation. One night last week, I decided to take the bus back home, and I got out at the lonely Former City-Office stop at about 10 PM. It certainly IS a creepy place to get dropped off at that hour, but still, instead of walking around the LONG WAY, taking the street-lit and paved sidewalks, I headed on, without flashlight, into the wilds- with the crazed frog choruses from nearby rice fields as background music! As my eyes adjusted to the darkness, I realized that the moon, though not full, would provide adequate illumination for me to navigate the dirt paths. Very soon along my way, I noticed the silhouettes of two large Ural Owls ( FUKURO) perched on a tree. They were unnerved by my presence, and silently took off into flight, displaying the outlines of their broad wingspans in the moonlit sky. MAGICAL! Transfixed, I stopped in my tracks to admire them, though in less than an instant they had vanished from sight. Straining my eyes in the dark to see the birds, I noticed something unusual up ahead- large and glowing ghostly white. A chill ran down my spine. 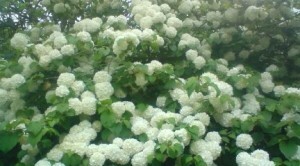 I approached slowly, and realized that it was no spectre I had come across, but a tree- more than two meters tall and fully bedecked with surprisingly large, round, white flowers. 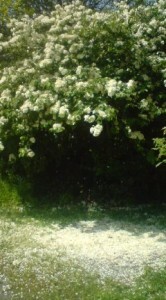 From the size and shape of the blossoms I realized it was an O-Demari tree (Viburnum plicatum var. plicatum f. plicatum), whose flowers in English have come to be called ( quite appropriately) JAPANESE SNOWBALLS! I stood transfixed for a few moments beneath the tree which glowed in the weak moonlight and seemed to come to life with each breeze- before continuing on my way home. The next morning, I knew that I just HAD TO take the bus into town, so that on my way to the stop I could get a look at the tree in the daylight. And it WAS as spectacular as it had been the previous night. And though not as mysterious as it had been in the moonlight, I still missed my bus. The O- demari, also known as the TEMARI BANA（手鞠花 ) in Japanese, is a member of the Honeysuckle Family, and is in fact a cultivar developed over the centuries by Japanese horticulturalists, of a native species called the YABU DEMARI (ヤブデマリ,V. plicatum var.tomentosum). It is interesting that if I show a close-up photo of these flowers to botanically-savy Japanese they all immediately assume that what they are looking at is HYDRANGEA. 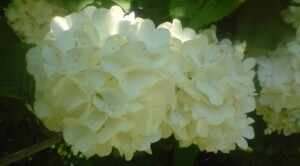 In fact, the O-demari DO look uncannilly like those much more famous ( and commonly found) blossoms. Another confusing point, is that there is another decorative plant in Japan called the KODEMARI, which is usually assumed to be a relative of the snowballs. There are two reasons for this. One is that they look quite similar, especially from afar. More importantly, however, are the names of these plants, which can be taken to mean LARGE DEMARI ( O-demari), and SMALL DEMARI ( kodemari).They are in fact, not even of the same family. Anyway, my mysterious encounter with the O-demari was so impressive, that I think I will have to try to get to a tree nursery and buy one for my garden. I hope to enjoy its SNOWBALLS in future Mays- especially on moonlit nights! Comments Off on A late-night encounter with O-Demari (大手毬) – Japanese Snowballs!